At A Supa Smile we have three questions about your teeth. Do you ever avoid looking at your smile in the mirror? Are you happy with what you see there? Or, do yellow teeth take away from the impact of your smile? If you answered “yes” to any of these questions, we can help! The great news is that we treat patients just like you, daily; patients who live with smiles that are less than perfect. And what we always point out to them, and what we want you to know, is that you don’t have to live with yellow teeth – together we can restore your stunning smile! Genetics: Sometimes, tooth color runs in the family. If your parents’ teeth are yellow, it’s likely that yours are a similar hue. Dentine: Teeth look yellow when the enamel is thin and the dentin underneath shows through it. Dentin is a deep yellow to brownish material inside your teeth under the enamel, and it’s often responsible for the yellow you see when you look in the mirror. Wear: Teeth inevitably turn yellow as you get older, as enamel wears away from chewing and exposure to acids from food and drink. Smoking: Smoking isn’t just an unhealthy addiction; it also leaves yellowish or brownish surface stains on your teeth. Foods: Many foods stain teeth. Tomatoes in pasta sauce, curry spices and berries all contain pigments that cling to tooth enamel and stain this surface. Even a healthy salad with balsamic vinegar dressing can leave an unsightly color on your teeth. Drinks: Coffee and tea are two of the most common causes of yellow teeth, but red and white wine are also to blame. Other culprits include dark and light sodas and sports drinks with artificial flavoring. Antibiotics: Tetracycline antibiotics stain teeth when they’re developing in the gums. Accidents: The impact of an accident or physical trauma can crack tooth enamel and damage the tooth’s interior, leading to discoloration that may indicate bleeding that needs professional attention. 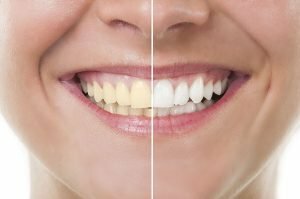 How Can I Prevent or Treat Teeth Discolouration? By making a few simple lifestyle changes, you may be able to prevent teeth discolouration. Also, improve your dental hygiene by brushing, flossing, and using a mouthwash daily, and getting your teeth cleaned by a dental hygienist every 6 months. A Supa Smile can give you a stunning, sparkling white smile in just 1 hour! Thanks to our longest lasting teeth whitening systems, you can now wear the white smile you’ve always dreamt of. In-office Whitening – Laser tooth whitening whitens teeth better and faster than other methods of dental whitening. Your teeth can get eight shades whiter in less than an hour using the state of the art laser light. This dental whitening method has been clinically proven to be safe and effective, with minimal to no side affects. Take Home Whitening – Your dentist fabricates a tray custom-fit your teeth, to which professional-grade whitening gel solution is applied. You must wear the custom trays from 30 minutes a day to overnight. By consulting a cosmetic dentist, who has all the skills and knowledge about whitening discoloured teeth, you can also avoid the risk of tooth sensitivity that are often experienced by DIY and over the counter whiteners. At A Supa Smile, we use the highest quality and advanced dental whitening systems that create long-term effects. Our treatments are safe and won’t harm your precious teeth and delicate gums. 1 Hour In Chair ZOOM! Teeth Whitening only $450 PLUS $50 cash back from Philips. A Supa Smile wants you to have the whitest possible teeth! We are conveniently located just off of the Maroondah Highway near Plymouth Road and Kent Ave, with public transport nearby. For more information about schedule and location, please visit our contact us page. Emergency dental treatment is also available! Call us on (03) 9723 0703 or book your appointment online to claim our teeth whitening offer.